Ride and Read! 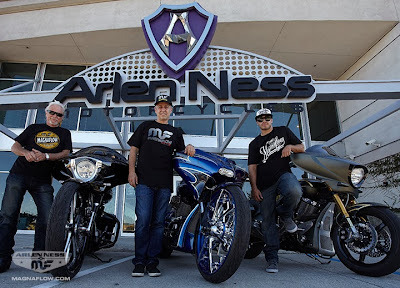 NEWS by Madness Photography - Onno "Berserk" Wieringa: Magnaflow Exhaust Systems Partners with Arlen Ness Motorcycles. Magnaflow Exhaust Systems Partners with Arlen Ness Motorcycles. Magnaflow, a Global Leader in High-Performance Exhaust Systems Partners with Arlen Ness Motorcycles on New Co-Branded Line. Product to Debut on Let It Ride TV Show. Rancho Santa Margarita CA: October 23, 2013. Magnaflow, a global leader in performance exhaust products, today announces a new partnership with Arlen Ness Motorcycles to manufacture and sell a complete line of co-branded exhaust products. Known as Arlen Ness by Magnaflow, the high-performance, high-quality, made in the USA exhaust systems will be designed by Arlen Ness for American V-Twin motorcycles. The new product line will make its world debut on the National Geographic Channel’s Let It Ride series starring Zach Ness on October 24, 2013. Magnaflow has been a leader in exhaust performance, technology, design and manufacturing for over 30 years. Arlen Ness is an icon in the custom motorcycle world with a 40 plus year history of building custom bikes and high end parts and accessories. Magnaflow, The Original American Performance Exhaust® with superior Quality, Power and Sound® has been the number one choice for over 30 years for those demanding maximum performance. Founded in 1981, today Magnaflow is a global leader in American made high-performance exhaust systems and catalytic converters. Headquartered in Rancho Santa Margarita, California, Magnaflow drives innovative exhaust design and engineering from their campus of buildings that includes a 350,000 sq. ft. state-of-the-art manufacturing facility that sets the industry standard for technology and precision craftsmanship, a 100,000 sq. ft. catalytic converter laboratory and manufacturing facility, a 90,000 sq. ft. research and development technology center and a 35,000 sq. ft. media center. Focused on moving the V-Twin motorcycle market forward, Magnaflow offers innovative designs that generate unparalleled performance and deep, rich, powerful American Muscle sound. Magnaflow, the manufacturer of high-performance, high-quality, precision fit made in the USA exhaust systems, is excited to partner with Arlen Ness Motorcycles. 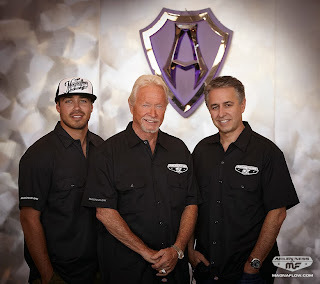 Arlen Ness is recognized around the world as the Godfather of Custom Motorcycles. An icon of the industry, Arlen Ness has been producing custom motorcycles and high end, trend setting parts and accessories for Harley-Davidson®, Victory and Indian motorcycles for over 40 years. Arlen Ness now turns his talents to designing a complete line of co-branded exhaust systems known as Arlen Ness by Magnaflow. Magnaflow, with their extensive experience and expertise, will manufacture, market and sell the new Arlen Ness by Magnaflow exhaust line worldwide. The Arlen Ness by Magnaflow exhaust line will make its world debut on the National Geographic Channel’s Let It Ride TV show October 24, 2013. Staring Arlen’s Grandson Zach Ness, Let It Ride has risen to be a highly acclaimed, top rated program in its first season on NatGeo. Tune in tomorrow night October 24, 2013 to see Zach and the Ness family fire up their new Arlen Ness by Magnaflow exhaust for the first time.